If you are licking your phone or computer screen right now, I hold no judgement :). This pic of these Chicken Rolls with Mushroom Ragu deserves a good lick. 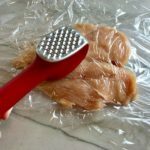 However, you will get much more enjoyment out of making this recipe and getting lost in the actual mouthwatering flavor, so I hope you do! 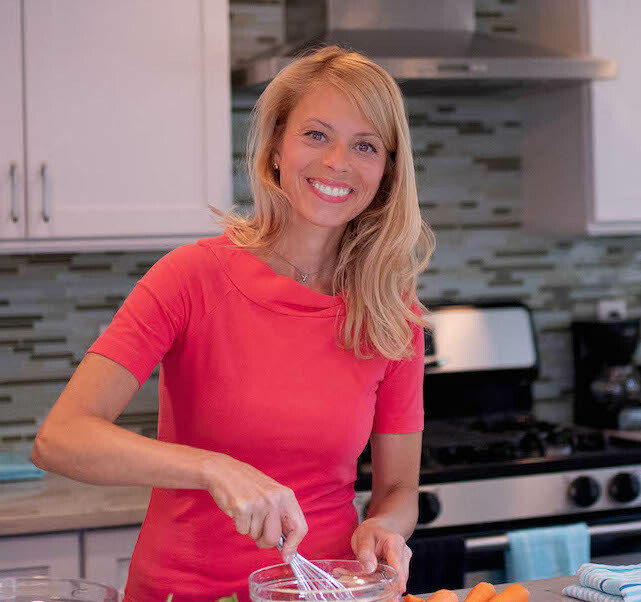 Before I get into the recipe, I would love to explain my unequivocal love and devotion to mushrooms. It all started as a small child growing up in the Midwest, outside of Chicago. 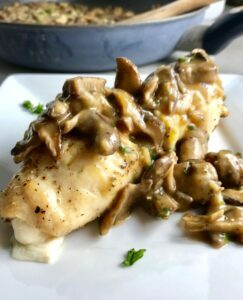 My Mom had a few different recipes with mushrooms, but my favorite was very simply a seared steak with Mushrooms and Au jus served with mashed potatoes and butter. Sounds like a midwest hearty meal, right? For us though, having steak was definitely a special occasion meal and since the mushrooms generally came with the steak, they were also considered special to me. So every year on my Birthday, when my Mom would ask me what I wanted for my birthday dinner, I would always say, Steak with Mushrooms! February is special month for us as we have 3 family birthdays, both of my daughters were born in February and my youngest daughter, Alexa shares a birthday with my Mom! 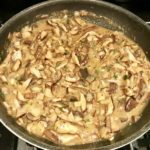 As I am trying to pass down my love for mushrooms to my girls, I add them to many different recipes. 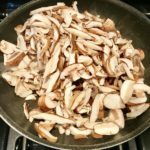 Here are some of my favorite mushroom recipes! I think you get it, I love mushrooms! So back to this yummy recipe. 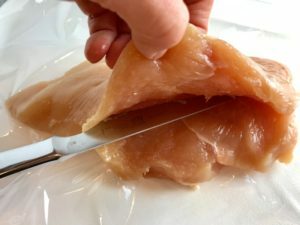 It starts with chicken breasts. I like to get free-range and raised without antibiotics, such as Katie’s Best. 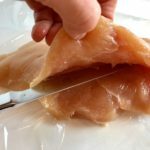 You want to get these as thin as possible for rolling, so you can either just pound it out or slice along the side and then pound it out just a little bit more, which is what I do. 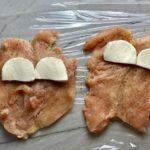 Next, you layer in the mozzarella. You can also add Basil, Spinach, kale, but I kept it simple in this recipe with just the mozzarella because, well let’s face it, it’s all about the MUSHROOMS. 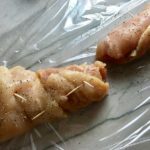 Once you roll it up, you can secure the roll with toothpicks and place on sheet pan. Rub Olive Oil around the rolls and season with salt and pepper. I start these in a preheated pan, where you sear the chicken on all sides. 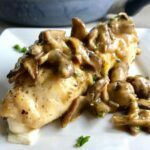 Then transfer the chicken to a sheet pan and cook 400 degree F.
Now comes the most important part of the recipe, the part that you’ve been waiting for and I’ve been waiting to tell you about…THE MUSHROOMS. 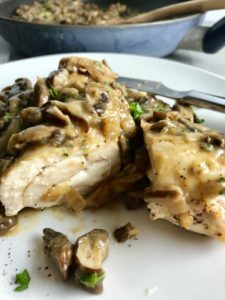 I like to use both cremini and shiitake mushrooms in this recipes. 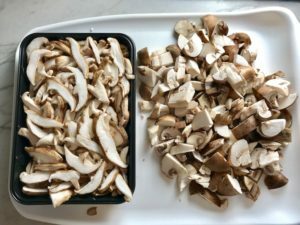 The cremini are meaty and earthy and bring a heartiness to the ragu, while the shiitake are rich and buttery and bring a creaminess to the dish. Together? Ahhhh!😍😍. 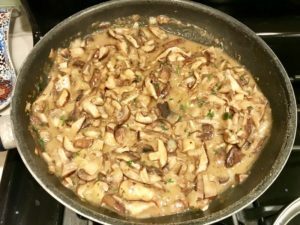 First, saute diced onion in the same preheated pan used to sear the chicken with a little extra virgin olive oil for about 3 minutes, then add the mushrooms along with oregano, salt and pepper. 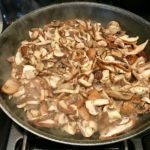 Saute for about 6-8 minutes, until mushrooms are cooked down. Then add the flour and stir to combine. Add the chicken broth and stir until it turns into a thick sauce, a chunky, hearty ragu. Finally add in the parsley. Once the chicken is done cooking, pull out the toothpicks and serve with the mushroom ragu over top. 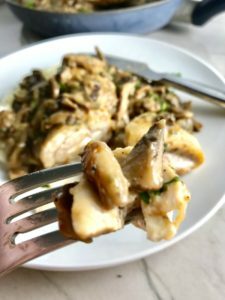 Again, the chicken has simple and mild flavor because the Mushroom ragu has all of the incredible flavor you could ask for! I love mushrooms! This Chicken Rolls with Mushroom Ragu really puts the mushroom in the hero role. The chicken is rolled up with gooey mozzarella and then topped with the Ragu. The Ragu has both Cremini and Shiitake mushrooms. 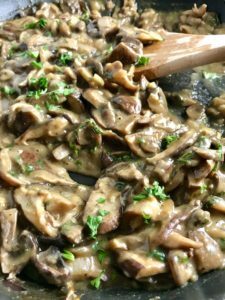 The Cremini mushrooms give the ragu the meaty, earthy, and heartiness and the Shiitake mushrooms given it the rich, buttery, and creaminess. 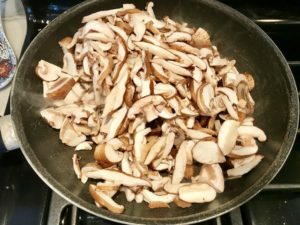 Dice the onion, slice the shiitake mushrooms and rough chop the cremini mushrooms. Shop the parsley: 1 tablespoon for Ragu and 1 tablespoon set aside for garnish. 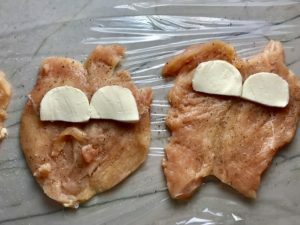 Take the chicken breast and start to slowly slice into the size, horizontally. Is you start to cut into the side, pull up on the top half to help the knife cut straight through. 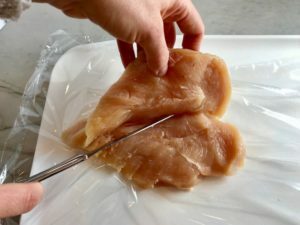 Continue to slice through the center horizontally until almost to the other side, but do not slice all the way through as you will open the chicken up flat. Season with salt and pepper. and then layer the mozzarella at one end. 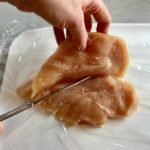 Roll the chicken around the mozzarella and secure the flap with toothpicks. Season the outside of the rolls with salt and pepper. 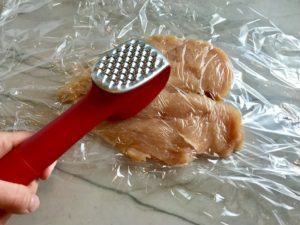 In a preheated (high heat) large saute pan, drizzle about a teaspoon of Extra Virgin Olive Oil (to coat) and sear the chicken on all sides. 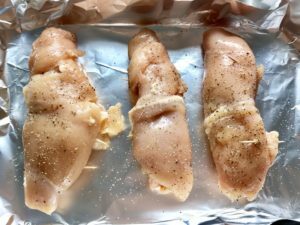 Then put into the preheated oven to cook for 15 minutes, until the internal temperature reaches 165 degrees F.
Saute the diced onion in the same pan used to sear the chicken on med-high heat with another teaspoon of Extra Virgin Olive Oil for about 3 minutes. Then add the mushrooms along with oregano, 1 tsp salt and 1/2 tsp ground pepper. 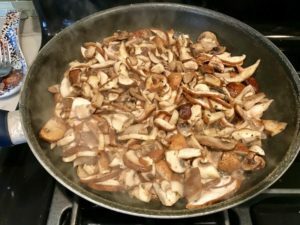 Saute for about 6-8 minutes, until mushrooms are cooked down. Then add the flour and stir to combine. Add the chicken broth and stir until it cooks down and turns into a thick sauce - a chunky, hearty ragu. Finally add in the parsley. When the chicken is done, plate each roll with a heaping scoop of the mushroom ragu right over top. Enjoy! !